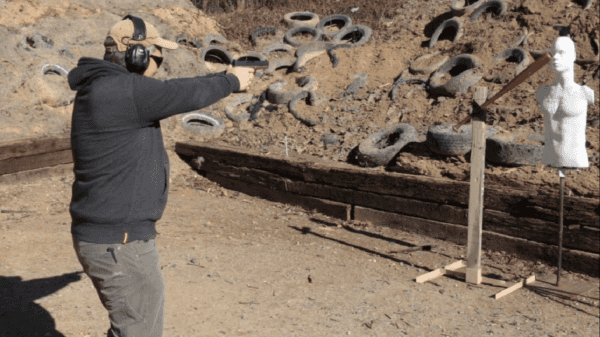 Can a Louisville Slugger stop a 9mm? Well, it did in the season 7, episode 8 mid-season finale of The Walking Dead. But what you see on TV isn’t always what it appears to be — or is it? In the finale, Rosita fired a shot with her Beretta at Negan, who was able to stop it with his Slugger wrapped in barb wire. His powerful bat goes by the name of Lucille. TwangnBang wants to know if this is even possible so he put it to the test, simulating the show’s exchange the best he can. He started with the purchase of a sturdy and rock-solid old-fashioned Louisville Slugger. However, he didn’t use real barbed wire, giving the bat a true advantage by not weakening it after securing the wire with fencing nails. Is it enough? The only modifications TwangnBang made to the Slugger was to paint it brown and trace the oval with a marker, according to the American Shooting Journal. The scene is set, the bat is secure, and the rubber dummy is in place. Will the bat take a licking, or will it succumb to the power of the Beretta? 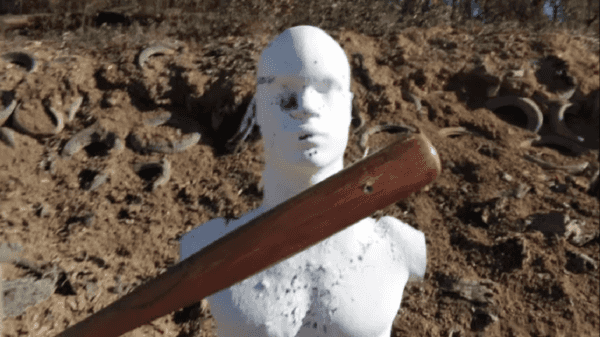 The first lead, round-nose bullet skimmed the bottom of the bat and blasted the rubber dummy. The second shot again went straight through the bat and pierced the face of the rubber dummy, which would have turned him into The Walking Dead if he wasn’t a dummy to begin with. While the first shot was a bit swanky, the second shot was dead on and splintered the bat. In the episode in question, consider that Eugene, the guy who loaded Rosita, hand loaded the ammunition used to take her shot at the bad guy, and the powder may not have been strong enough. This means that TwangnBang’s store-bought ammunition could have been a bit more powerful. Either way, both rounds cycled the slide just the same. The Walking Dead episode was named “Hearts Still Beating.” Maybe that is because the bullet fired by Rosita missed Negan and his heart was still beating? That is just not the case in TwangnBang’s version of what would have really happened. According to the experiment, Negan wouldn’t have been saved by his Louisville Slugger. Keep in mind, TwangnBang did everything possible to give the Slugger the advantage, but Lucille still fell short. Such is often the case with life or death battles portrayed on TV.